Just one hour from Tokyo on the shinkansen, Echigo Yuzawa is a fun get-away to a snowy paradise. There are mountains for skiing, and even play areas for kids to sled. Even ski gear and snow boots can be rented, so no need to go up with heavy bags. We left sunny Tokyo and after passing through a long tunnel near our destination, was surprised to be arriving in a winter wonderland. We used Yuzawa Ski Park Resort with a free shuttle from the station. After arriving we signed up for a kids’ ski lesson and rented a sled. Yuzawa Kogen is walking distance from the station. We took a cable car from the base to halfway up the mountain where there was a blizzard and we were in the clouds. We stayed at Taki no Yu and had our own private onsen (photo above right) in our room. The kid-friendly ryokan had Purare-ru train set in the lobby. The cuisine was very good. 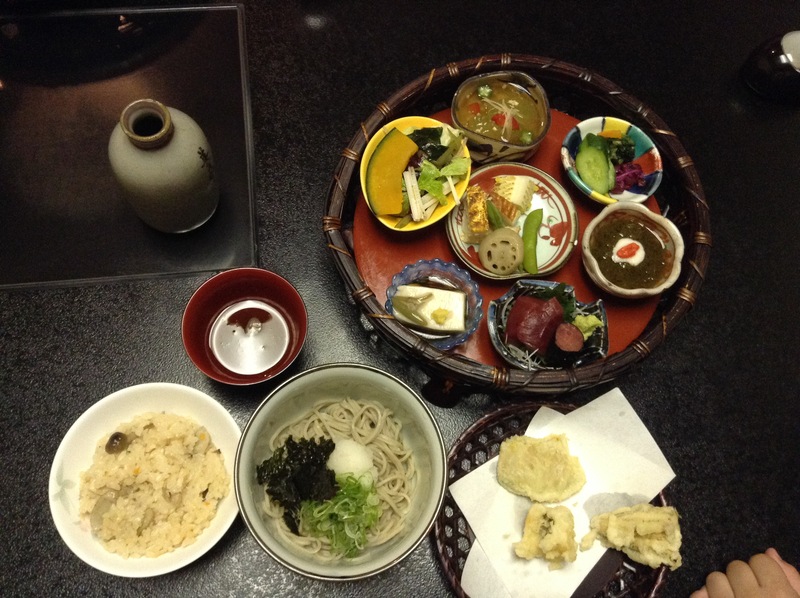 Below are photos of the small dishes for the okayu breakfast (left photo) and the appetizers for dinner (right photo). Taki no Yu. Request the Kikyou Room for the private onsen in the room. The water made my skin feel soft and the temperature was not too hot. The rotenburo, outdoors onsen, was set in snow. Soaking in a hot tub while snow falls down is so relaxing. The room we stayed in had two beds and a separate tatami room for futons. It said it could sleep up to seven, so a good option if traveling with family. The station has a large shopping area for omiyage including regional food products, knives, fresh produce, and rice. Niigata is famous for Koshihikari grown in Uonuma. There are several restaurants including a sushi-ya, soba-ya, and a nice cafe for mattcha latte and soft serve made with local milk. 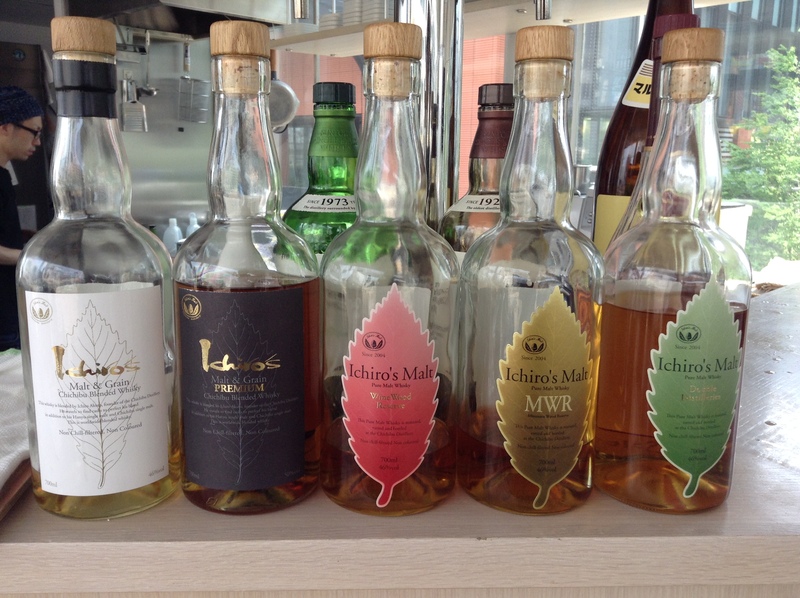 Ponshukan is a saké tasting room for a flight of five saké starting at 500 JPY. There is a visitors’ center in the station that is a warm seating area and has free wifi as well as some brochures in English. For the return shinkansen we picked up two bentō at the ekiben stand in the station. Both bentō include a heating unit under the bentō that heats it up in five minutes. There is a big selection of cup saké sold at the station. Echigo Yuzawa would also be an easy day trip from Tokyo. Round-trip tickets are less than 15,000 JPY. One tip, ask for seats on the second floor of the shinkansen for better views. Another tip, many roads and sidewalks have running water to keep the snow from accumulating. Be sure to go with waterproof shoes, or rent a pair of boots at the information center just outside of the station. Going out for sushi as a family cuts out many options. High-end sushiya are out of the question as are many mid-range spots. Our kid loves sushi, could eat it three days a week and when we go out, it’s often for sushi. We eat a lot of sashimi at home and will also make donburi rice bowls and make luscious spreads for temakizushi hand-rolls. But, we don’t make nigirizushi and go out for that. Sushi Zanmai is a popular chain with branches throughout the city that is kid-friendly and offers a good value. The owner, Kiyoshi Kimura, is famous around the world for having paid $1.76 million dollars for a tuna a while back. Kimura-san is a tuna fanatic and if you love tuna, then go for the maguro-zukushi (maguro-zanmai at his shop) plate which is made with different cuts of tuna. There are about a dozen stores in the Tsukiji/Ginza area alone. The weekday lunch sets start at about 1,080 JPY ($10). Sushi Zanmai has a variety of shops including kaiten-zushi, revolving conveyor belt sushi, to proper restaurants with a counter and tables. All of the shops we have been to are boisterous. Some shops do allow smoking, so frustrating. At a recent visit we asked to be moved away from a smoking table. I was in the mood for vegetables this evening, so I took the handrolls which was made of cucumbers, umeboshi, takuan (pickled daikon), shiso, natto, and kampyō (soy simmered gourd). Hit the spot for me. Below is the link for Sushi Zanmai. On top you can change to language to English to see what is in your neighborhood. Dining out with kids can be challenging in Tokyo. One tip is to look for restaurants that have koshitsu, private rooms. You can then close the doors and the kids can play in the private room without disturbing the other diners. Adults can enjoy some conversation without worrying about the kids. Koshitsu are also nice when getting together with family or friends and you’d like some privacy. Mimiu near Shinjuku station has several private rooms exactly for this occasion. It is a popular restaurant with families, so best to book a private room in advance. Be sure to inquire about seating. Some koshitsu have tables and chairs while others are tatami mat rooms with low tables. Ideally there will be a hole under the table with a sunken floor, called horigotatsu. These can be surprisingly comfortable. Some other tips when using a tatami room. You’ll be asked to take your shoes off. If you need to use the rest room while dining use the sandals that are set near the room. Most koshitsu will have a bell to ring when you need something. Mimiu has a few set lunches to choose from, starting at about 2,200 JPY. Above is one of the lunch sets. The food was not spectacular, but was passable. I was surprised that they did not have options for the kids. The set menu was definitely too much food to order another lunch for the kids, so we shared. 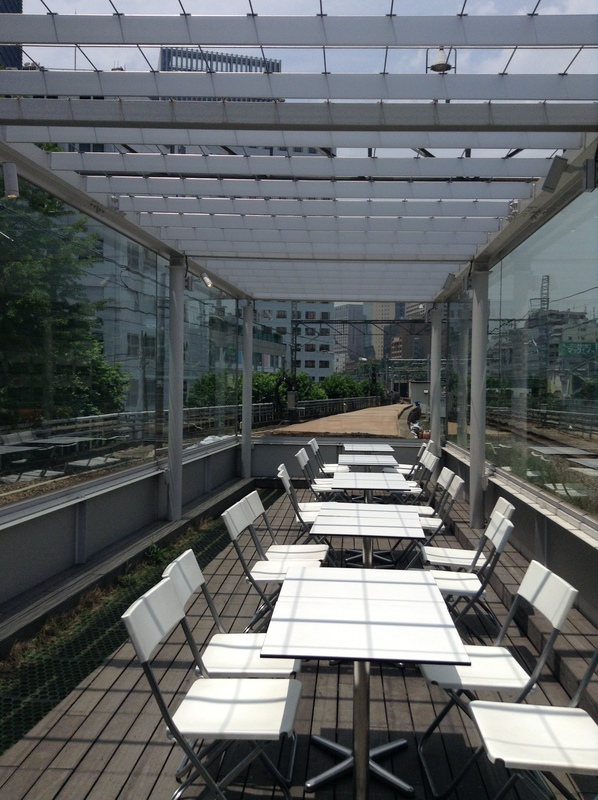 This location is conveniently located a minute or two from Shinjuku station. Mimiu has a few other locations in the city. When we reserved the room we were told that there was a two-hour limit. 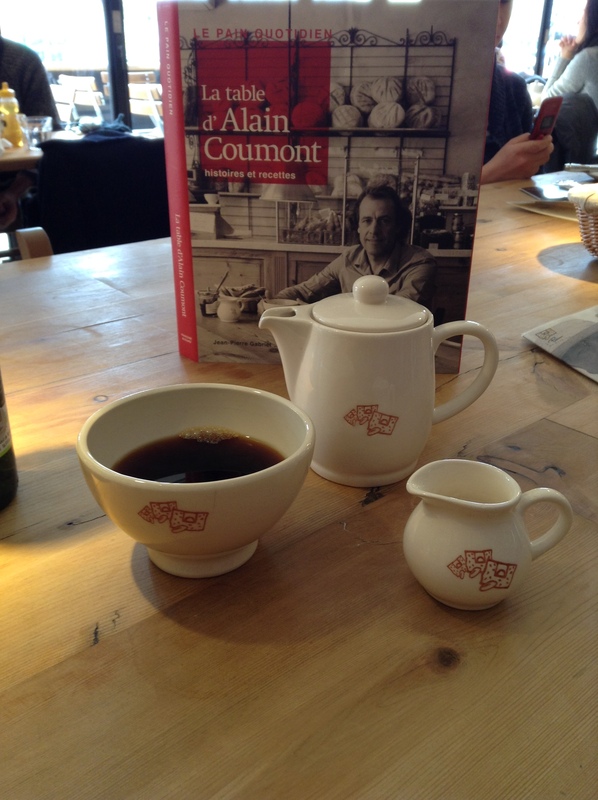 I lived in Brussels for a year and one of the things I remember the most is the Le Pain Quotidien down the street from my apartment. The bakery opened up early in the morning so I could stop by and get a croissant or pain au chocolat to start the day. The large communal table in the middle of the cafe is perfect when dining solo. On the table were jars of jam and nutty and chocolate spreads for bread. Open-faced tartine sandwiches as well as salads round out the menu here. The menu sadly does not have any Japanese influences. It is pretty much the same menu you’ll see in Belgium or in New York City. A fun shop to come in solo or with some friends. 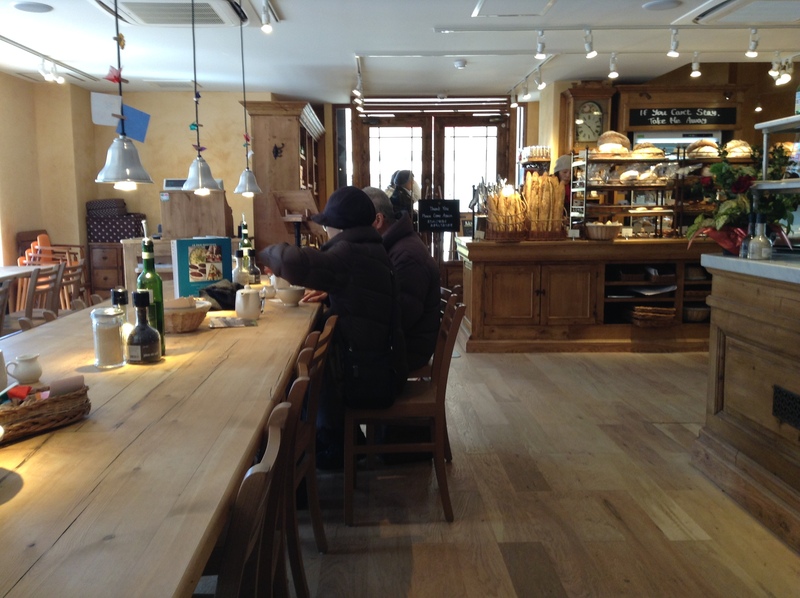 Le Pain Quotidien is in a new shopping complex that opened up recently, nonowa Higashi-Koganei, which is on the Chuo line between Mitaka and Kokubunji. 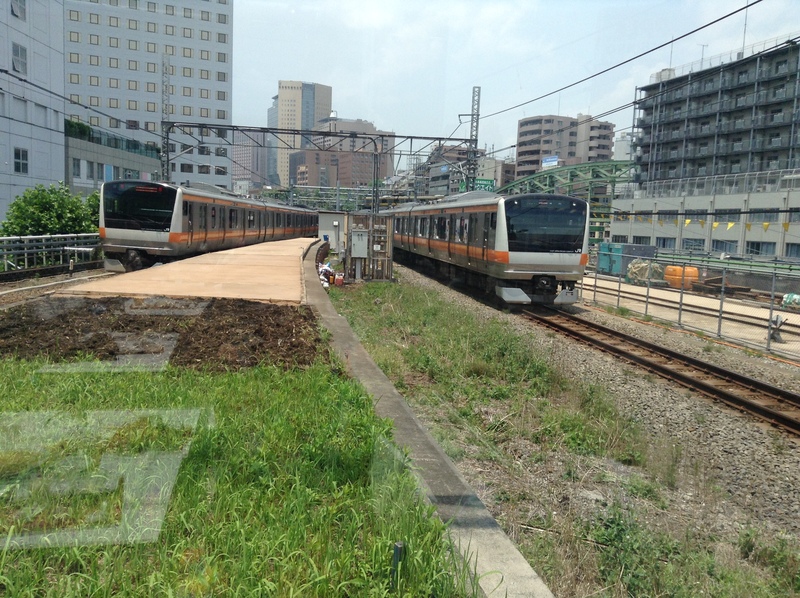 nonowa can also be found in Nishi-Kokubunji and in Musashi-Sakai, also on the Chuo line. The shops are in the train stations and this Higashi-Koganei shop is all underneath the Chuo line. A smart move to use the space underneath the train tracks. While it’s possible to hear the trains passing above, it is not nearly as noisy as spots like the restaurants underneath the Yamanote line near Yurakucho station. The organic coffee is served in a bowl. Reminds me of bowls of hot chocolate in Europe. The coffee comes in a pot and is about two cups plus. Next time I come back I will bring some reading with me and settle in and be transported back to Belgium. The shop is brightly lit as one wall of windows faces south. On this day there were a few older couples and many young women in the shop. There is a small, but well-stocked bakery in the front of the shop for take-away or for eating in the cafe. 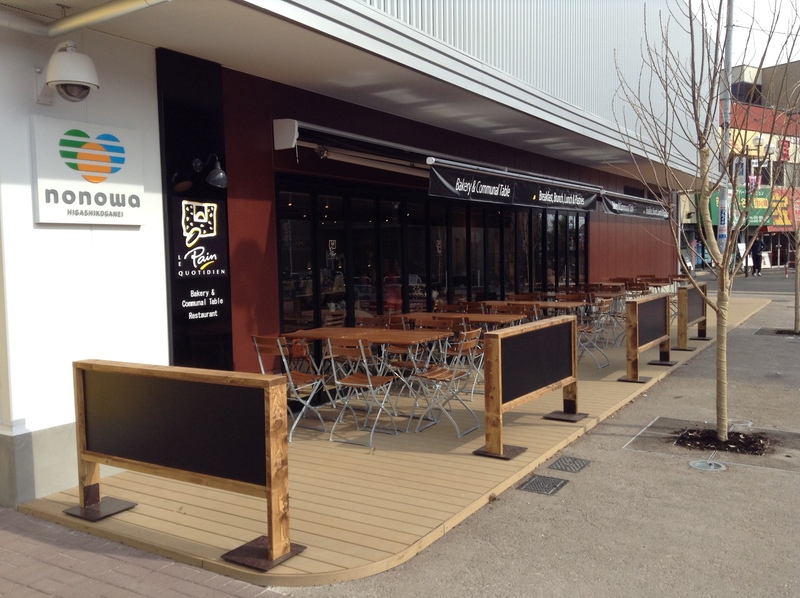 There is also outdoor seating which will be perfect once the weather warms up. And, operation hours are 7:30 – 22:00. 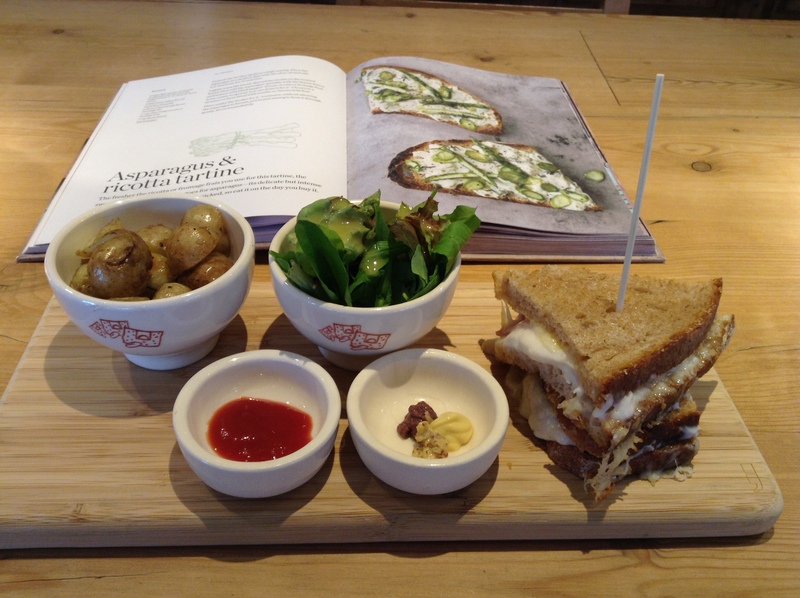 Le Pain Quotidien has branches in the city. It’s not worth the trek out to Higashi-Koganei. 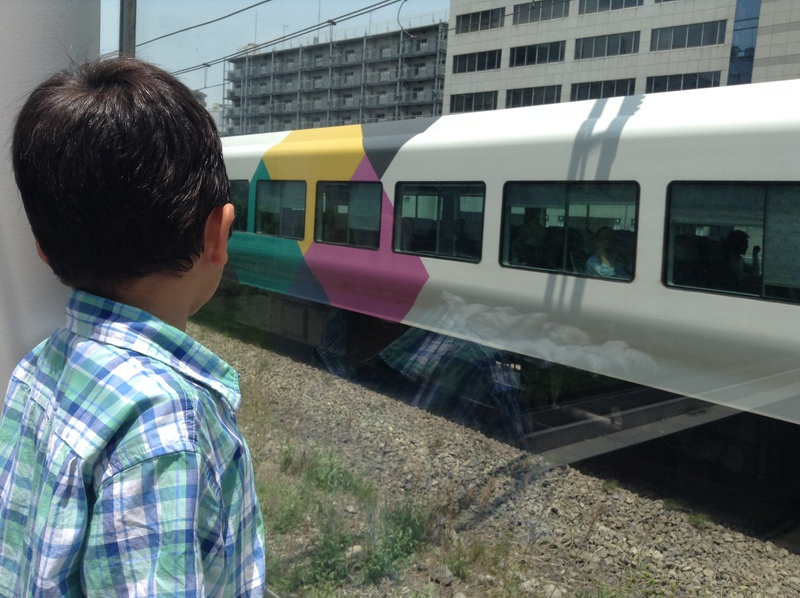 But, if you find yourself traveling on the Chuo line, it’s good to know that it’s here. A vegetable-friendly menu with salads and sandwiches. 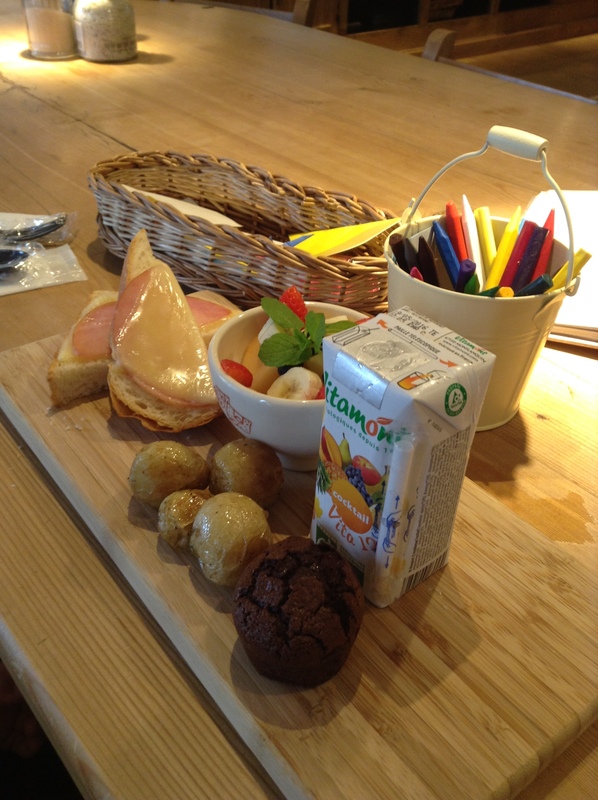 The Kid’s Lunch is hearty with an open-faced sandwich, fresh fruit, roasted potatoes, juice, and a chocolate muffin. Best of all, the waitress set a bucket of crayons on the communal table along with some origami paper. The crayons bought me enough free time to leisurely peruse their cookbook.